Region 4, Sweet Adelines Intl. Spot On has been together since February of 2013 and we have had one heck of a journey since we formed. We joined Harmony Incorporated and met the wonderful women of Area 4 in June of 2013, where we received the title of Area 4 Champions. In November of that year, we traveled to Windsor, Ontario where we earned first place in the International contest, awarding us the title of 2013 Harmony Incorporated Harmony Queens! 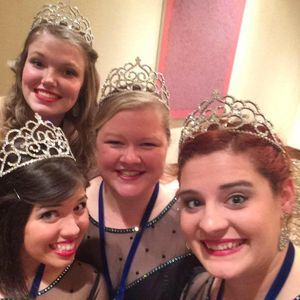 Our championship year was incredible; we met new people, learned new songs, and enjoyed the busiest week of our lives in Louisville, KY November 2014 where we received our permanent crowns. We are now competing in the Sweet Adelines organization, where we have placed both second and third in two consecutive Regional competitions. Recently, we thought it would be wacky to switch parts!!!! This new endeavor has been challenging, exciting, and given us a new outlook on the future of our competition journey! Spot On loves to work hard and prepare for contest, but above all things, we are each others' best friends. Our hobbies include: quoting Mean Girls and Gilmore Girls, eating HuHot Mongolian Grill, dressing up in crazy costumes for themed New Year's Eve parties, sending memes to each other through our quartet text thread, buying/wearing things with polka dots ("spots") on them, and making each other laugh. It's true when they say that your quartet isn't just your quartet, but it's also your family. Our families mean the world to us, and we try to all be together as often as possible. With each family being made up of two parents, a brother, and a sister, we sure do have a lot in common! Our parents all met each other through barbershop, we are all "barbershop brats", and the two married ladies met their husbands at barbershop related events. To say that we owe our lives to barbershop would be an understatement. And what better way to spend time with our friends and families than to ring a good old barbershop chord.